Picking out a theme for your wedding can be hard, but if you're a bride-to-be with a collection of Harry Potter memorabilia that's worth an estimated £4,000, then your theme might come along much easier. We're thinking: a magical celebration with candles, owls and Dumbledore himself. Well that's exactly what Leah Rice (proud owner of said memorabilia collection) and her now husband, Dax, decided on for their wizard-worthy bash at National Brewery Centre in Burton Upon Trent, United Kingdom, over the weekend (the venue was picked because of the old steam engine on the property, which Leah thought resembled the Hogwarts Express). Despite not having read the books or seen the movies, Dax didn't mind the magical theme. "I was worried it would be really gothic, but it wasn't," he told The Daily Mail. The bride said that "apart from marrying Dax," her favorite part of the day was the ring bearer performance—an owl swooped down the aisle with the rings and landed on Dax's arm. 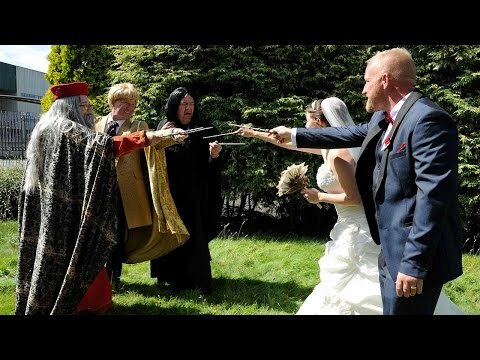 But there were plenty of magical moments: Leah's sister dressed to the nines in full-on Albus Dumbledore attire to walk the bride down the aisle; the bridesmaids donned colors that represented Gryffindor, Hufflepuff, Ravenclaw and Slytherin; and there was even a guest dressed as Snape in their photos. And for the honeymoon? The Wizarding World of Harry Potter in Florida! Just kidding—the groom wouldn't budge on that one. Mexico, it is.